technology, the world’s first periscope-style dual-camera technology for smartphones. The technology offers 5x lossless zoom capability on a smartphone, a breakthrough innovation that sets the bar higher when compared to the 2x zoom functions available in the market today. Users will also enjoy an image stabilization capability like never before while keeping the device thin and sleek. OPPO worked for almost a year to develop the revolutionary periscope-styled dual-camera technology. Currently, more than 50 patents have been filed for this technology. Mr. Sky Li, VP, OPPO, MD of International Mobile Business & President of OPPO India, said, “The ‘5x Dual Camera Zoom’ has opened up yet another realm of possibility in terms of smartphone photography, and is a reflection of our dedication to delivering on what our customers want and need - to take beautiful and clear pictures”. The “5x Dual Camera Zoom” technology was inspired by the idea of a periscope on a submarine. The dual camera utilizes wide-angle, and telephoto lenses, and the housing for the telephoto lens uses an innovative periscope-style structure. By shifting the angle of the telephoto lens by 90 degrees, the lens will have the space it needs for a deep zoom. A periscope-style prism then directs the path of the light entering the camera by 90 degrees, and sends the image through the telephoto lens when the user zooms in on a subject or object. The technology has completely re-designed the current standards of dual-camera solutions that can only achieve a 2x zoom – a feature that still disappoints many of today’s demanding mobile users. OPPO strived to achieve a 5x zoom capability that will allow users to fully capture landscapes, portraits, and close-ups -- all the typical scenarios that are commonly captured in a digital camera. This new dual-camera setup helps to keep a smartphone thin. The 3x optical zoom, matched with a proprietary image fusion technology for digital zoom, give users the industry’s first-ever lossless 5x dual camera zoom. Thanks to the periscope-style construction, the 5x dual camera module is now only 5.7mm thick, which is even 10 percent thinner than a typical 2x optical zoom lens in a smartphone. Typically, when the zoom factor increases in capturing an image, even the slightest vibrations can have a dramatic effect on the clarity of the image. The other breakthrough of this “5x Dual Camera Zoom” is the Optical Image Stabilization (OIS) solution. 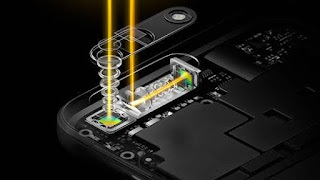 Different from other manufacturers who use optical image stabilization on the wide-angle lens, OPPO took a new approach and applied OIS directly to the telephoto lens. Through the OIS technology, both the prism and telephoto lens intelligently sense vibrations and compensate in real time. The all-new OIS solution can improve the performance of previous generations by 40 percent, and the prism mechanism dynamically adjusts its angle at precise increments of 0.0025o. This technology ensures that images are clear and stable even at full 5x zoom.